I go here for Meditation and yoga classes and seminars as well as private sessions and massage. When I was going through difficult medical issues, this was pretty much the only studio I found in Bethesda that had a number of restorative yoga and tai chi classes each week that I could participate in. The center offers evidence based Mindfulness practices for the whole spectrum of wellness. I’m now able to participate in the more physically demanding classes on my good days and the restorative classes when I need those. I highly recommend for anyone looking to optimize their physical and psychological health and wellness. My first experience at the mindfulness center was exactly what i've been searching for. I practice yoga and meditation regularly and decided to extend my practice at the mindfulness center during a lovely meditation taught by Aurora. She made our experience so welcoming and accepting of everyone that attended the class - we started off with 3 "OMs" and going in a circle introducing ourselves and talking about where our current state of minds were. She peacefully guided us with just her voice and it really allowed us to sync in with our own breathing techniques. I look forward to coming to this center regularly again and would recommend it for everyone on any level. Would highly recommend The Mindfulness Center. After suffering severe back pain from a car accident, I decided to go a head and give Chiropractic a shot. At first I was a bit skeptical but after my first visit with Dr. John Alloway, I could already tell a significant improvement. After a few more sessions my pain was completely gone. If you’re reading this, and this sounds similar to something you’ve experienced, I would highly recommends this place. TMC is a warm, welcoming place with top notch practitioners. I take restorative yoga classes with Roxanne and highly recommend it to anyone new to yoga or with any physical limitations. Enjoyable and good for you! The core of a successful Wellness Program is always Change. The Mindful Center supports us in the ability to improve health, mental, physical and emotional that has been damaged by lifestyle stresses. 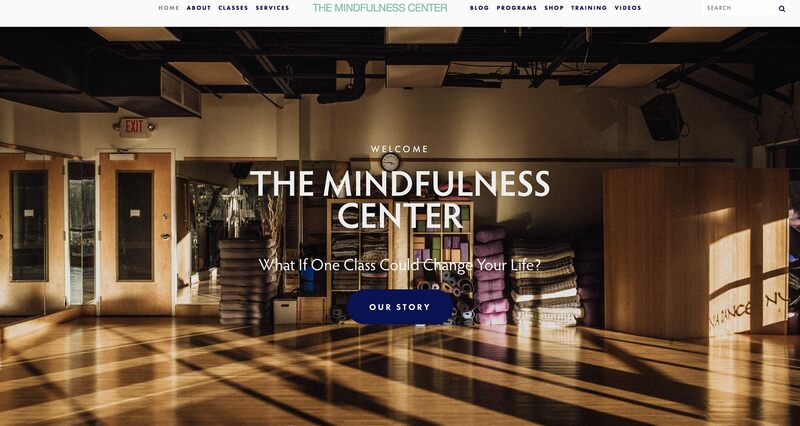 The Mindfulness Center became for me a haven, a place where people undergoing similar experiences, yet not knowing each other, could always find the right class or program to suit their personal needs, whether it was through a Meditation practice, Yoga,TaiChi or Qigong, or through healing with Reiki , Acupuncture, Chiropractic or Medical Qigong Therapy. The workshops I attended were extremely well planned, highly professional, authentic, motivating, stimulating and educating. As a famous Yogi Master once said: ‘Let my soul smile through my heart and my heart smile through my eyes’. The Mindfulness Center has put that smile on all our faces. The Mindfulness Center is a gem! I enjoy their yoga and meditation classes. I also went through the Meditation Teacher Training program and would highly recommend it to those who want to deepen their practice and teach others. Thanks to Debbie and the team for this wonderful mission! I've been going to the Mindfulness Center for many years. I've taken a few workshops but have mainly worked with Mike Basdavanos for qi gong and James Foulkes for craniosacral. They both work to build your own healing capacity rather than relying on them. There are practitioners who just want you to keep coming so they can get paid... not at the Mindfulness Center! I would highly recommend them. Mike has a workshop coming up and I plan to sign up for it because I feel so amazing afterwards. If you're not sure, go for a yoga or meditation class and check it out. The Mindfulness Center team of experienced practitioners work together to provide you with the best possible care in mind-body therapies. By integrating multiple modalities of care and practice, we enable you to find your path to greater health and well-being. Healing is a journey of self-exploration, and our service providers are dedicated to working with you to support you along this journey, and providing you with evidence-based best practices of care.